Coming out of Winnipeg's West End, Gord Kerr was an exceptional right wing for the West End Orioles. Drafted by the Montreal Canadiens he turned pro with Seattle Ironmen of the PCHL and played several years of professional hockey in various leagues. 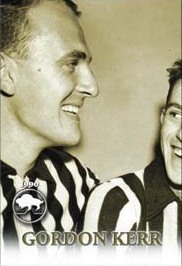 After an industrial accident in 1963 cut his professional career short, Kerr picked up a referee whistle and became one of the finest hockey officials ever produced in Manitoba. He served as the Referee-in-Chief of the Manitoba Amateur Hockey association for over 30 years and officiated in Memorial Cups, Allan Cups and Centennial Cups. His refereeing skills led him to the 1972 Olympic Games in Sapporo, Japan and the 1976 Olympic Games in Innsbruck, Austria. In addition Gord Kerr refereed in the Western Hockey League and the World Hockey Association for several years.